The reason you purchased the NOOK version of the Samsung tablet is probably that you actually intend to do some reading: books, magazines, newspapers, and catalogs. Good news! That’s just about as easy as tapping your finger. And don’t worry about running out of space for books. 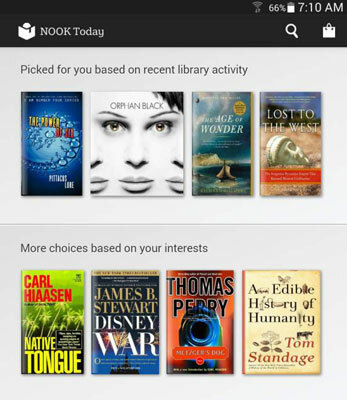 Your NOOK account comes with unlimited use of an online archive from which you can get titles anytime you have a Wi-Fi connection. Your Samsung Galaxy Tab 4 NOOK comes with a few free books, plus samples of others. So you could, if you want, jump right in and start reading. But first, you might want to go shopping. And you get a regular set of personalized recommendations. The more you buy, the more appropriate the suggestions become. The NOOK Shop on the Galaxy Tab 4 NOOK can only be portrait mode (taller than wide). You can scroll up on the page to see special offerings in each of the departments. 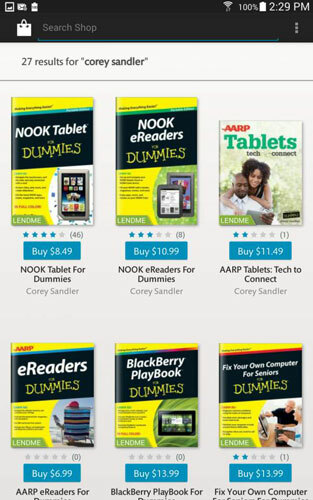 From the Home screen, tap the NOOK Shop app. Or, tap one of the advertising banners that promote the bestseller list or special sales. If you wind up somewhere other than the main shop, tap the shopping bag icon in the upper left. Just like when you walk into a brick-and-mortar bookstore, you have to make your way past promotions for new titles and specials. What you see today is likely to be different from what you saw yesterday or will find tomorrow. The departments — Books, Magazines (includes Catalogs), Movies & TV, Kids, Apps, Newspapers, and Comics — are on the right side of the screen. Explore the categories or look for new releases or bestsellers. Use voice recognition to say what you’re looking for. Handwrite your entry on the touchpad. Scroll through the results by dragging your finger up or down. A blue banner shows the prices on the B&N site. If you see a gray Purchased label, you already bought that title for the current account; once you pay, you can always download it again without paying again. Tap the cover to see its details. Sometimes you’re offered a sample from the book. To drop a not-very-subtle hint to someone about the perfect birthday gift for you, tap the Share icon to send an email detailing what you’ve found. You can also rate and review your thoughts about the title, posting to Facebook or Twitter. 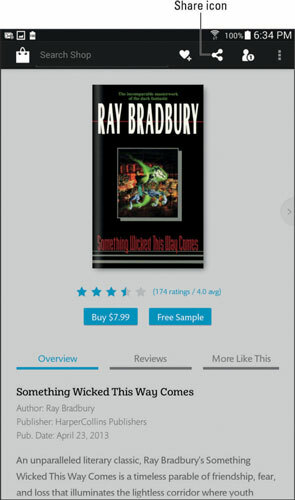 To buy an eBook, tap the blue box that shows the price. Are you sure? You’re asked to confirm your purchase. Some books are offered for the can’t-beat-it price of free. Publishers do this to try and build an audience for a series of books. If you ask for a copy of a free book, you’re still asked to confirm your decision. 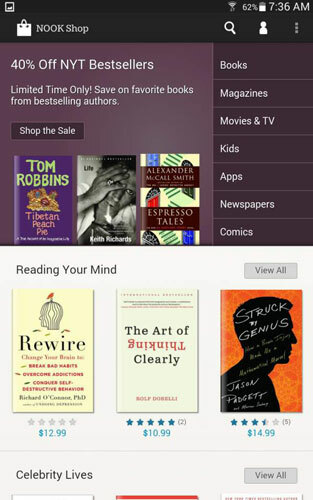 The eBook is charged to your credit card and the title comes to your Tab 4 NOOK, usually within a few seconds. If an eBook’s download is interrupted because of a problem with the wireless connection or other causes, the download automatically resumes the next time it gets a chance. The new item appears on the Active shelf on the Home screen and in your library. And it wears a New badge until you open it.